Herff Jones takes pride in creating college graduation rings for students and graduates of West Virginia University. 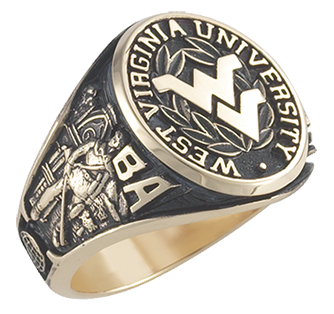 Reward yourself with a symbol of excellence by selecting the West Virginia University ring which suits your style, experience and achievement. All juniors and seniors who purchase a WVU Class Ring are strongly encouraged to attend the Ring Day Ceremony where they will be presented with their rings. The deadline for attendance at the Spring 2019 Ring Day Ceremony is February 17, 2019. A ceremony is held each Fall and Spring semester and allows students to share this special moment with family and friends, all sharing in the rich traditions of West Virginia University. Students who are unable to attend the specified ceremony can pick up their rings at the WVU Bookstore on the downtown campus beginning the day after the ring ceremony. Rings will not be mailed.